Clear Regular Strength Anti-Redness Exfoliating Solution brings about an immediate reduction in blackheads, white bumps, and acne by unclogging pores and reducing inflammation with 2% Salicylic Acid. Unlike most products designed for acne-prone skin, Clear Regular Strength Anti-Redness Exfoliating Solution doesn't use harsh, irritating ingredients such as Alcohol, Menthol, Peppermint, or Camphor that can make acne worse. Its light-as-water texture leaves skin feeling like there is nothing on your face, yet delivers powerful anti-acne benefits all day long. Provides clearer, smoother, more even-toned skin. Eliminates redness from acne lesions. Use twice daily. 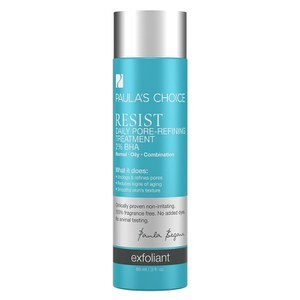 After cleansing with Paula's Choice Clear Pore Normalizing Cleanser, soak a large cotton ball with Clear Regular Strength Anti-Redness Exfoliating Solution and gently stroke over face. Pay special attention to acne- and blackhead-prone areas. Do not rinse. Avoid contact with eyes, eyelids, and mucous membranes. If excessive dryness or peeling occurs, reduce application to once per day or once every other day. Other Ingredients: Water, Dipropylene Glycol, Pentylene Glycol, Polysorbate 20, Butylene Glycol, Glycerin, Sodium Hyaluronate, Dipotassium Glycyrrhizate, Allantoin, Panthenol, PEG/PPG-17/6/Copolymer, Methyl Gluceth-20, Glycereth-26, Bis-PEG-18 Methyl Ether Dimethyl Silane, Sodium Hydroxide, Sodium Metabisulfite, Tetrasodium EDTA.